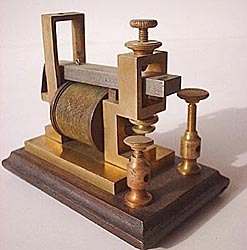 For a long time after the telegraph was installed on the railroads, the operators were required to get the incoming message on a device called a "register" that would print the dashes and dots allowing the telegraph men to see the message during decode. The more experienced operators got to be able to "read" the code on the fly just by listening to the small sounds the register made. An upper level Erie Railroad division supervisor once observed this happening (it was strictly forbidden), and set up a series of test messages that were all decoded by "ear" without error. From then on the operators were allowed to do away with the paper tape that had the code marks and just listen to the clicks. Eventually the resister was redesigned into the sounder (no paper tape, louder clicks). 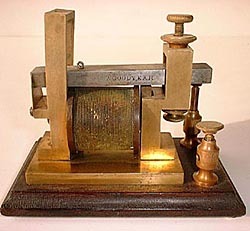 The device used to generate (as opposed to receive a telegraph signal a "key". 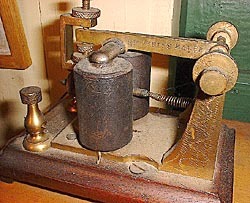 Railroad telegraphers became especially adept as using the key and could transmit information at great speed. 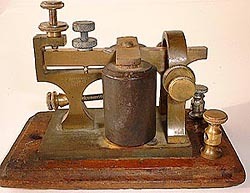 The telegraph was eventually replaced by the telephone in railroad operations (See note below), but not before a generations of railroaders spent whole careers mastering the skills needed in the use of morse code. 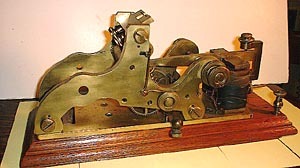 Shown below are some rare telegraphy devices used in railroad operations. These devices are from the Clyde Conrow collection. Information and photos are courtesy of Tom Stranko. Additional telegraphy items are shown on a second and third page. Above: Two views of a "Goodyear" Sounder. New York, Ontario & Western Railway. 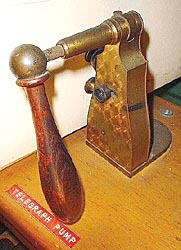 Above: A telegraph "register" unit, made in Utica, NY by the Chubbuck Co. Above: Two views of a "G.M. Phelps" Sounder. 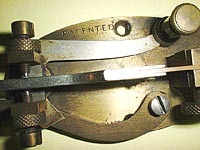 Left: A "pump" key which could be operated from any direction and quickly. 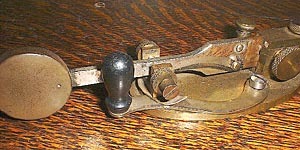 An "easy to use" telegraph key. The key is the device that creates the code signal. Thanks to Tom Stranko for the other material on this page.